From inside and out, iCamp Elite has created an entirely revolutionary new class of recreational vehicles in North America. Its stylish design and manufacturing techniques bring a contemporary life style to the people who love camping and the outdoor life. 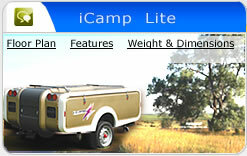 iCamp Elite is a fully laminated travel trailer. The body is reinforced with aluminum tubing frames. High gloss fiberglass skin is laminated over structural Styrofoam made by the Dow Chemical Company. 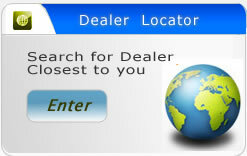 The interior walls are covered with wall paper for luxury and easy care. The furniture is sandwich structured made with solid wood and high grade plywood and finished with semi-gloss PU paint for style and durability. The furniture is curved with a style and for the most space usage. iCamp Elite is equipped with most classic travel trailer amenities. Best of all, it is equipped with a spacey one piece modular bathroom with shower and toilet. The trailer has an optional digital video/audio system and Apples iPod connection for both audio and video entertainments. 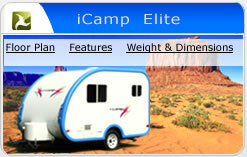 iCamp Elite is the first RV product with iPod? connection enabled. Light weight construction and aerodynamic design is prefer for todays low fuel consumption. The interior height is a comfortable 5'11" making it the most spacious small trailer in America. iCamp Lite is a completely revolutionary tent trailer for camping lovers in North America. The body is stylish, light weight, aerodynamic and fabricated with modular fiberglass techniques. With the unique design, when the tent is open to both sides, the trailer converts into a spacey three-room tent with two beds and one living area. iCamp Lite is ideal for a young family with kids. With iCamp Lite, the family will enjoy a quality outdoor family life style and that is where the fun begins. The weight of the trailer is an amazing 1,337 LB GVWR, which can be towed with almost every vehicle (Please consult with your tow vehicle manufacturer for towing capacity) available in the US. Because of light weight and aerodynamic design, the drag is limited and therefore the tow vehicle will consume less fuel. Light weight and compact size, make the trailer more maneuverable and it can be store in the garage.